Hi ladies! 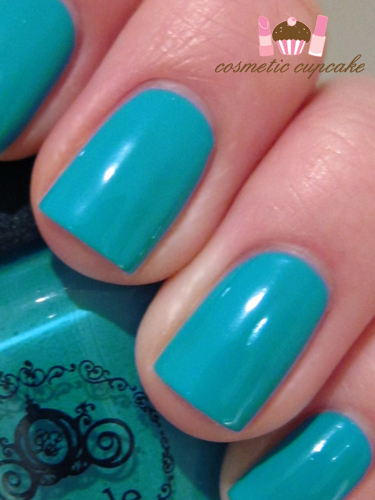 I have a quick NOTD for you today using one of the polishes I hauled in HK last month. I had no idea Lioele had nail polishes and I happened to stumble across these at Colour Mix so of course I had to get some! I picked up two and the first one I'm going to show you is Lioele 28. As with a lot of Asian products, they don't have names only numbers argh! I looked this shade up online and it appears to be called Modern Mint. It is NOT a mint polish though! 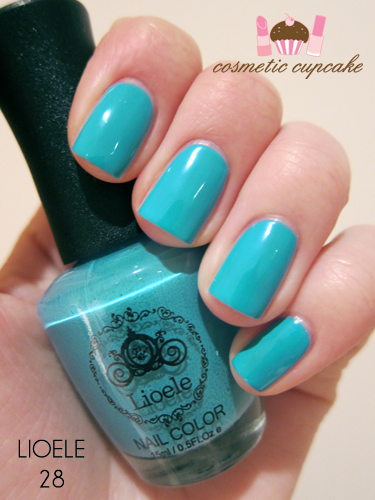 It's a bright turquoise creme and is just gorgeous. Unfortunately my camera hates these types of shades and I went to great pains to try and capture the colour correctly! I had to do some minor tweaking to get the colour right. Modern Mint is very pigmented and you could probably get away with one coat if you're very careful but I used two for this manicure. The formula was fantastic and it applied super smoothly. The brushes are very wide and remind me of the OPI pro wide brushes and are great to use. The only downside is I don't think these polishes are Big 3 free though.. the smell was awful! I can never leave a mani alone so I added a coat of Clarity 468 which Christina gave me in our last swap package. 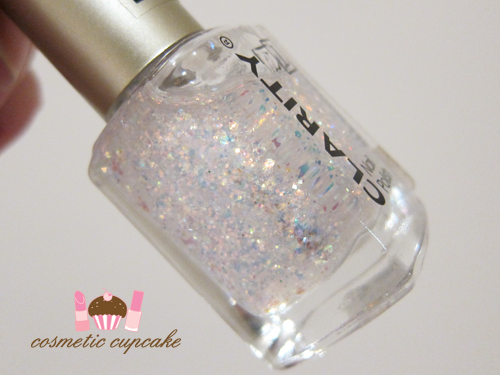 468 is a fun glitter polish loaded with small multicoloured glitter particles. I didn't want to detract from the gorgeous Lioele colour so I only added one coat of the glitter which is pictured below. I then added a coat of Coffret D'or gel topcoat (also gifted to me by Christina! ^_^). I love this colour and the added glitter made it even more fun! I definitely need to add more blues and turquoise colours to my collection! What's your favourite blue polish? The glitter is so pretty on the turquoise colour! Oooh... I'm liking this Liole! I always see the massive nail polish vat in Colormix and am wary about quality/smell, but this colour looks awesome! This colour is beautiful :) and it suits you so good! Oh that is such a stunning colour! And welcome back from your holiday :) Btw do you have any tips/tricks regarding removal of glitter polishes? I love the look of them but the mere thought of the time and hassle for removal puts me off from using them! My Hong Kong adventures Part 1 - Yum Cha!